New Orleans, La. – Entergy Corporation (NYSE: ETR) announced today that, based on comprehensive review and analysis, it has concluded that joining the Midwest Independent System Operator (MISO) will provide meaningful long-term benefits for the customers of the Entergy operating companies. The Entergy operating companies will provide detailed analysis supporting these conclusions to their retail regulators in May and anticipate submitting formal proposals to those regulators later this year, with a target implementation date for joining MISO of December 2013. MISO is an independent, nonprofit, Regional Transmission Organization that supports the reliable delivery of electricity in 13 U.S. states. Regional Transmission Organizations are independent entities that manage and operate the transmission system within a specific geographic area. With Entergy as a member, the footprint of the organization would extend from the Canadian Border to the Gulf of Mexico. 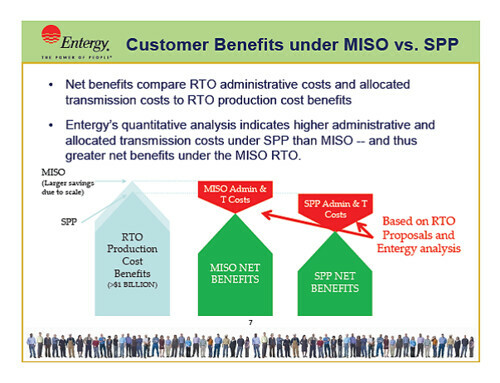 Two important factors in the decision seem to be (1) MISO’s markets are already well developed, while the nearer Southwest Power Pool (SPP) markets are still being developed, and (2) Entergy expects administrative costs to be lower under MISO than SPP. A summary of expected benefits reported by Entergy. Here is a report from New Orleans City Business. The MISO press release: “We are pleased and humbled that Entergy has chosen to join MISO,” said MISO President and Chief Executive Officer John R. Bear. More background and analysis from MISO. Just eyeballing a map, the casual observer might be surprised that the New Orleans-based utility chose to join the Indianapolis, Indiana-based MISO over the Little Rock, Arkansas-based SPP. Members of the Southwest Power Pool actively urged Entergy to join them. SPP has compiled a list of regulatory considerations that all appear to favor Entergy joining SPP rather than MISO. SPP’s summary of the benefits of Entergy joining SPP noted, among other points, that there are 41 transmission links between SPP members and Entergy and 9 transmission links between SPP market participants and Entergy. The distinction between “members” and “market participants” arises because four SPP members-but-not-market-participants are embedded within the Entergy transmission system. These utilities – Cleco, Lafayette Utilities System, Arkansas Electric Cooperative Corporation, and Louisiana Energy and Power Authority – may be inspired to reconsider their participation in SPP. The 9 direct links between Entergy and SPP market participants is 8 more than the single line the Entergy has contracted to provide a link between it and MISO. Of course whether one RTO or the other is a more “natural” fit, the competition among RTOs for members is one factor that should promote better RTO management. MISO has lost members to SPP before (i.e. Nebraska utilities, SPP also serves as independent transmission coordinator for former MISO members Louisville Gas & Electric/Kentucky Utilities). MISO and PJM also see members contemplating switches between the two RTOs. Among other things, the selection – should it stand – means that resolution of “seams issues” between MISO and SPP become much more important.